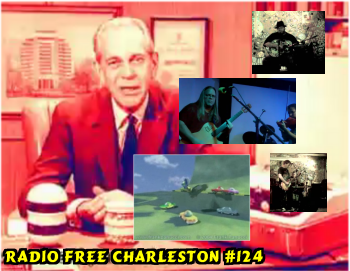 This week we still find ourselves in March, 2011 for an episode of Radio Free Charleston filled with an eclectic mix of music and some great short films. The show kicks off with Frank Panucci’s “Prelinger Finger Zinger,” yet another collection of public domain footage from Prelinger Archives, set to a jaunty industrial dance tune. Our first musical guest is Slate Dump, a one-man-band ,formerly of Morgantown and currently based in Memphis. Following some animation from Frank, we have Electro Biscuit which was Greg Wegman, Kai Haynes and RFC Big Shot, Brian Young. This performance was recorded at LiveMix Studio shortly the beloved institution was shut down by minions of the Pope. Wrapping up the show we have the RFC debut of Red Audio, a great pop punk band from Summersville that just recently reunited. Next week the RFC Flashback presents episode 125 with music from Mother Nang, Pepper Fandango and Adrian DeQuiros. Also included in this show is Kitty Killton and the most wholesome animation we’ve ever shown! Host segments will mess with your mind.